"The problem has been, even though I had this longing, even though I wanted to know about my father, even though I wanted to talk about him, I never brought him up because I knew that bringing him up would hurt the people that knew him." Be Good, Smile Pretty is the emotionally hard-hitting directorial debut from documentary filmmaker Tracy Droz Tragos, and it is not only a very deeply personal film, but also one that seems to willingly invite the viewer along with her as she struggles to learn more about her dead father, a man that she never knew. In 1969, Tragos' naval officer father, Lt. Donald Glenn Droz, was killed in Viet Nam when she was only four months old, and though her mother remarried not long after, there was apparently always some kind of percolating emptiness inside about who her father was. According to this film, that empty feeling inside Tragos only deepened through over 30 years of living with a family that chose to simply never talk about it. That all changed in March of 2001, when Tragos was cruising the internet and, on a whim, decided to do a search on her father's name. The results revealed a graphic article detailing the events surrounding his death, which occurred during a brutal river ambush, and as she read things she had never been told, it opened some kind of repressed emotional floodgates. As this documentary unfolds, Tragos turns the camera on her mother and it becomes painfully clear that perhaps there was much that apparently wasn't discussed during the preceding 34 years, and in an often awkwardly voyeuristic way, we are given an up-close look at these personal revelations. In Be Good, Smile Pretty, which takes its name from the way Lt. Droz used to sign his letters home, over the course of just 56 heart-rending minutes, Tragos pulls fragments of information from a variety of sources: her mother, her grandmother, and her uncle, as well as Sen. John Kerry (who was a friend of Lt. Droz) and the recollections of men who served alongside her father. As expected, these memories are tear-filled, but in the end they eventually blend together to finally paint a picture of the father that only saw Tracy Droz Tragos once, just two weeks before his death. Far be it from me to know the right way for a parent to have handled such a tragic situation, but witnessing the things Tragos learned just from her mother, things that finally personalized and put a face to what had mostly been just a name, seem downright shameful to have been kept from her for so long. A box in the attic reveals a 32-year-old taped phone conversation, and we are led to believe this is the first time Tragos has ever heard her father's voice, and somehow it just didn't seem like the kind of thing a mother would have or should have kept from her daughter. Wars do shatter lives, that is hardly a new revelation. But it is devastatingly compelling, and maybe a bit inspiring, to see such deep grief eventually replaced by a kind of peaceful understanding, and Tragos has made a very personal film that documents that experience. And, yes, it will make you cry. Image Transfer Review: Be Good, Smile Pretty consists largely of video camera interviews, and the 1.85:1 nonanamorphic widescreen transfer is more than serviceable. Color levels do fluctuate depending on available lighting, and much of the film has a home movie feel to it, which only enhances the personal element. Audio Transfer Review: Audio is a basic and perfunctory 2.0 stereo mix that does just what it needs to, which is deliver snippets of spontaneous dialogue understandably. The presentation here is very simple, but that does little to detract from the emotional intensity of the material. Extras Review: The extras are listed as extended interviews, but I suppose you could also call them deleted scenes, but either way it amounts to over a half hour of additional tear-inducing footage. The first segment is called The Children (20m:26s), and features five interviews with other children who lost a father in Viet Nam. The second piece is entitled Viet Nam Veterans (15m:46s), and it also contains five separate interviews, this time with some of the vets featured in the documentary. Also included are filmmaker background and bios, a brief photo gallery, and a batch of Docurama trailers. The disc is cut into 12 chapters. 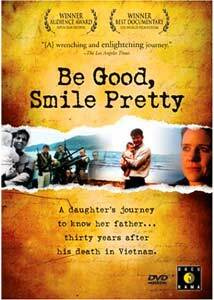 Be Good, Smile Pretty is an incredibly moving and heartfelt journey of discovery that examines one woman's desire to learn about the father she never knew, a naval officer killed during a river ambush in Viet Nam when she was only four months old. This isn't a war film that takes sides, rather, it focuses on one man who died tragically and certainly before his time. Tracy Droz Tragos' documentary about her search is unflinching in its revealing, raw emotion, and I defy you to watch this and not weep right alongside with her. Yet another powerful winner from Docurama, this one is highly recommended.